Stanford was supposed to slide back to being, well, Stanford after Jim Harbaugh left. It didn't happen. David Shaw kept the momentum rolling and the Cardinal is regularly mentioned among elite teams. Beating Oregon twice in a row certainly helps your standing, as does winning 26 of 27 home games, including 16 in a row. Stanford is next to impossible to beat in California, where it has won 33 of 36 games. Key early game to watch: Sept. 6 against USC. USC fans mutilate a Stanford Tree piñata before Saturday's game between the teams at the Los Angeles Memorial Coliseum. The rejunvinated Trojans beat the Cardinal, 20-17, before 93,607, which included Miami Dolphins offensive lineman Jonathan Martin (photo after the jump). This series of photos is from Image of Sport, a one-stop sports photography wire service and digital archive to meet the demands of daily newspapers and editorial publications. You can view the full gallery by clicking here. 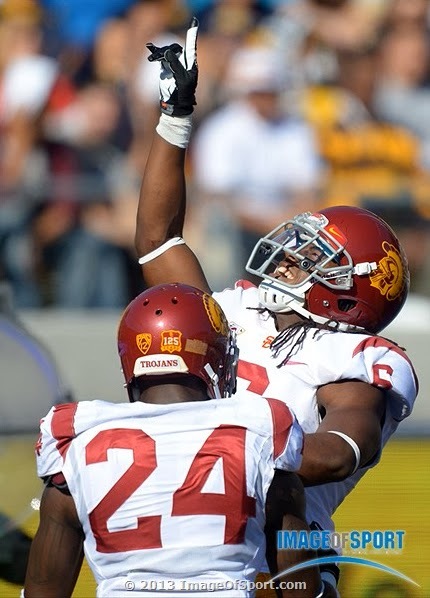 Josh Shaw (6) and Demetrius Wright celebrate a USC touchdown during the Trojans' 62-28 rout of California on Saturday at Berkeley. The win by the fast-improving Trojans is no reason to boast because it came against the 1-9 Golden Bears, but it did set up a showdown this Saturday against Stanford. Image of Sport was at Memorial Stadium and you can see more images after the jump. View the complete catalog by clicking here. 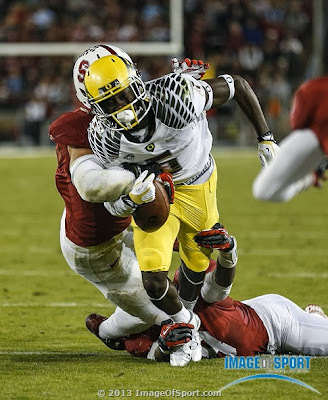 De'Anthony Thomas said before Thursday night's game that he thought his Oregon Ducks could score 40 against Stanford. 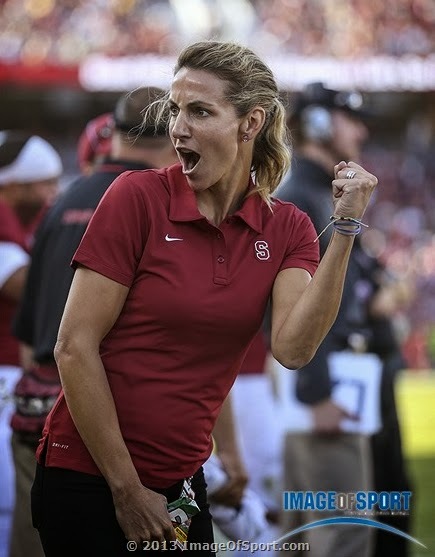 Then they teed it up and the Cardinal silenced the Ducks for three quarters and held on for a 26-20 victory at Stanford Stadium. Gone are Oregon's hopes for a Bowl Championship Serie title and quarterback Marcus Mariota's shot at winning the Heisman Trophy. Stanford will move up the BCS ladder but needs help to get into the title game. Image of Sport was at Thursday night's game and there are more photos after the jump. You can view the complete catalog by clicking here. Stanford alum and Olympic swimming medalist Summer Sanders was on the sideline Saturday night to watch the Cardinal dismantle Arizona State, 42-28. The photographers of Image of Sport were at Stanford Stadium for this Pacific 12 showdown. There are additional images after the jump, and you can view the full catalog by clicking here.